Although the second volume in Kim Stanley Robinson's War and Peace of Mars is not as strong as the original it's still very readable. While there were aspects of the first book sorely missed in the second (the journey to Mars, detailed explorations of the planet), overall the novel reaches an appropriate and interesting climax as a second revolution on Mars meets with more success. 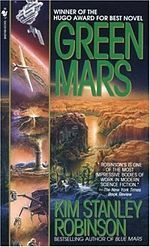 Green Mars follows on from the events of Red Mars, although it's clear within the first few pages that quite a few years have passed since the cataclysmic revolution depicted in the closing pages of the first novel. Each section follows one of the characters as the terraforming of Mars enters a new phase, the increased surface warmth and denser atmosphere allowing primitive plant life to flourish. While the book more or less proceeds chronologically, the reliance on the different perceptions of the characters provides a fragmented and often contradictory view of Mars. The powerful multinational corporations in the first book have merged into transnationals and even metanationals, assuming direct control over nations on earth and colonies on Mars. The remains of the original 100 settlers of Mars and their descendants slowly piece together the fractious Martian underground into a force able to wrest control of the planet from the corporations, ultimately taking advantage of an ecological disaster on Earth to spark the second Martian revolution. One of the perspectives that really resonated with me, this time around was the ardent terraformer Saxifrage Russell. As in the first book, Sax is an ambiguous figure within the novel, working towards the establishment of a human-friendly ecosystem upon the fourth planet of system, but ignoring the impulse to preserve the unique features of the planet. Sax never really gets his due in the first book, but in Green Mars, Sax attempts to leave the safety of the underground to regain a position in the terraforming efforts on the planet. He has his face altered and identity changed. Ultimately, he becomes, at least for a few chapters enough of a different person that even an enemy can't recognize him. Sax's misadventures play into a larger Robinson theme, the nature of identity and self once science radically extends the life of human beings. Like most of the original settlers, Sax has lived long enough that his original memories have begun to fade, it doesn't seem so far fetched that he would be able to (mostly) evade detection as a new person, but there is something poignant about a scientist so passionate about his work he's willing to sacrifice his own name and history. Just as human begin to construct an artificial environment on Mars, they also appear to manufacture artificial lives. While this section does drag, it also shows off Robinson' maturing craft as a writer. While I had real trouble relating to many of the characters in the first book, I never lost the emotional center of Sax's tragic arc. The other major focus in the story, as hinted above, is the second revolution on Mars. The first revolution was less of an uprising and more of a man-made disaster. Robinson describes entire cities razed, the surface of the planet lashed with the dismembered space elevator cable, Valles Marinaris inundated with ice gushing from deep aquifers. The second time around, the revolution proceeds more deliberately, the strategy less all-out war and more calculated decapitation. Unlike the first book, the political factions behind the second revolution are more fully realized and even though the revolution is somewhat anticlimactic (deliberately so), the ending is much more satisfying. Another high point is the Dorsa Brevia agreement, a very short document created by the various factions of Mars that serves as a kind of Declaration of Independence for the societies of the planet. The document's creation is a model of consensus creation and its wording contains a strange power. Something like the opening mission statement of Star Trek or the three laws of robotics, the Dorsa Brevia Declaration has the potential to transcend its source material. It's utopian in character, describing a multicultural society holding individual efforts, common space and resources, and reasonable terraforming efforts to a place of prominence. Somehow I really bought this declaration, both because of the messy, authentic, controversy surrounding its production and because the statement carries with it the power of understatement. Green Mars, itself, is not a work given to understatement. Robinson obviously fell in love with his material, trading long, discursive meditations upon space exploration and terraforming technology for long, discursive meditations upon future history and exotic politics. Also, not all of his characterizations were as convincing as Sax. In particular I struggled to understand Jackie Boone's role in the story. Few of the other character could stand her and yet by the start of the Second Revolution she was clearly the focus of a large cult of personality. Why? A chapter from Jackie's perspective may have gone a long way to adding conflict and urgency to that part of the story. I had trouble finishing certain sections of the long beginning, and ultimately much of it seemed redundant. Basically Robinson decided to hold his characters in a kind of stasis until he could figure out a way to have them reemerge into the political and social concerns of the new novel. I liked the depiction of the eco-oasis of Zygote and later Gamete but ultimately it felt like sterile exposition when the topic he was so obviously cared about was the impending second revolution of Mars. Robinson writes characters as stand-ins for ideas and points of views. He almost seems frustrated when his characters do something outside of his expectations. Enormous amounts of the book are devoted to future histories, detailed explorations of terraforming techniques and debates over various passionately held ideologies. This is a novel of ideas. If you like those ideas or at least consider the elaboration of them an interesting exercise, then you will like this book, perhaps even love it. However, fans of traditional space opera will find little here for them. The science is as dry as the red dust of Mars and the revolution at the closing purposefully and skillfully bloodless. Reading Response to "A Good Man is Hard to Find." Are stories about utopias morally superior to stories about dystopias? By writing about futures where governments break down, resources run dry, pandemics run rampant, and zombies wolf down unsuspecting pedestrians, are we making those things more likely to happen? Give credit where credit is due, +Robert Llewellyn asked a provocative question in his post to the the sci-fi community the other day. Does the preponderance of dystopian, post-apocalyptic (a word he doesn't actually use, but I feel fits his description of most zombie movies) come from the fears of the ruling class (predominantly white, anglo-saxon and rich)? Are these futures presented to us because that's the future the elites fear, one of rapidly reduced power and prestige? It’s back to the real world this week after an entire weekend in Arisia 2019. I go to this convention every year, but this one will definitely be special to me. For one thing, this is the year that felt, at least for a moment, like it wasn’t going to happen. If the debacle with the e-board wasn’t enough, there was the strike at the Westin. The convention felt slimmer this year for sure. A lot of people self-selected to not come this year and honestly with the smaller, more confined venue of the Boston Park Plaza, that was a decision enormously beneficial to my enjoyment of this con.